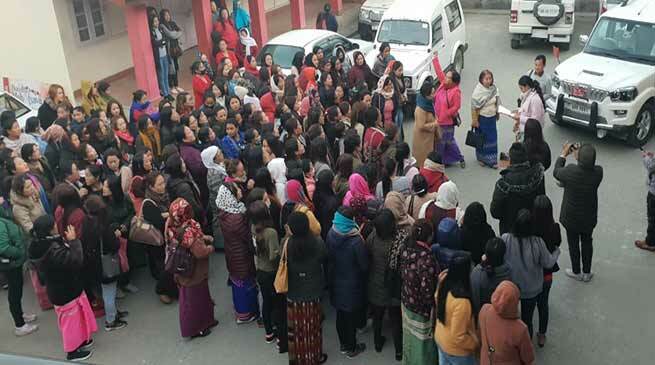 Several women organisation carried out protest march against the ill behaviour and attitude of the Arunachal Scout and misbehave with a women police personal at Bomdila on November 2nd and 3rd during the Buddha Mahostova festival celebration. Also a meeting and dharna was held at Buddha Peace park, Bomdila organised by the Women Welfare Society (WWS) led by Sonam Yangzom of WWS and Social worker Ngomba. More than 250 lady officers and officials of various department of the district headquarter attended this meeting. They condemn the incident of vandalising of the police station by the 2nd Arunachal Scout Jawans. A memorandum was also submitted to the Deputy Commissioner citing the incident of November 2nd night, the Jawan of 2nd Arunachal Scouts an inebriated condition have misbehaved and manhandled the lady police personnel who were on duty on Buddha Mahotsova celebration at Buddha stadium, Bomdila . They alleged that the 2nd Arunachal Scouts jawans have abused and used unparliamentarily words and threatened the lady police personnel. Meanwhile Indian Civil and Administrative (Central Association) (IC & AS) President Rakesh Srivastava who is Secretary, Ministry of Women & Child Development, Government of India, New Delhi have also strongly condemn 2nd Arunachal Pradesh Scouts Battalion led by Col. F B Firdauz and adjutant Major Kaushik Roy who vandalised government property and physically assaulted the District Magistrate and Deputy Commissioner and Superintendent of Police and other officials of the Police Station on November 2 at Bomdila in West Kameng district of Arunachal Pradesh. In the above incident none of the procedure and law have been followed by officers and jawans of 2nd Arunachal Scout. If such incident is allowed to go unpunished and not deterred through prompt, strong an firm action. It would not only embolden such perpetrator but also shake the basic foundation built over years, the letter said. At back home The Confederation of Service Associations of Arunachal Pradesh (CoSAAP) has vehemently condemned the barbaric act of Arunachal Scout personnel at Bomdila. CoSAAP place several demands to the State Govt. for immediate actions which include institute inquiry committee to be headed by Secretary to Govt. of A.P. level or DIGP. to book the Scout personnel who were responsible for such barbaric incident, to draw strict line of action to be maintained by Arunachal Scout personnel wherever they may be.